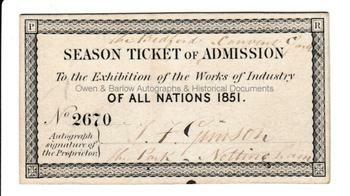 The Great Exhibition (1851) Exhibitors Season Ticket. 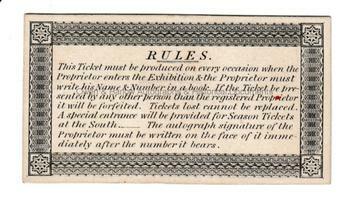 This ticket of admission no.2670 was issued to T[homas] F[oster] Gimson of The Park, Nottingham. Staying at The Bedford, Convent [sic] Garden. It is signed by him, as was required, and this gave him admission to the Exhibition for its duration. Stout card. 8.5 x 5 cms (3.25 x 1.75 inches). Engraved decorative border. Rules printed on verso. In fine condition. Thomas Gimson (formerly of Tiverton, Devon) had taken out patents for various inventions for improvements to the doubling and twisting of cotton and silk in 1823. He later relocated to Nottingham, where he established a successful lace manufactory. One presumes that it was these lace products that he exhibited at the Great Exhibition.